Sometimes a beer is complex, complicated, chaotic even. A depth that arrives in waves, perhaps too much at first but later unravelling to reveal an intricate balance of flavour and taste. For such a beer to be fully enjoyed an attentive, considered drinker is required. Someone willing to invest the effort to pull apart those flavours, appreciating them on their own and as part of the whole. 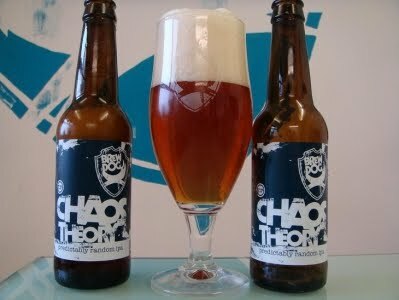 And then you have beers like Brewdog Chaos Theory. A stand and deliver type beer. A beer with an air of self confidence. A beer comfortable in its own skin, it knows who it is and what it’s about and isn’t afraid to tell you. Put simply, Chaos Theory is a showcase for the Nelson Sauvin hop. It’s a single hopped IPA brewed to 7.1 percent ABV and has recently returned for a one off short run due to popular demand. The aroma is distinctly Nelson Sauvin: oily, gently floral, white grapes, kiwi fruit, a slight hint of white wine and perhaps some musk. In the mouth it has a lot of sweetness up front, the hops follow through from the aroma, a bitterness powers in that’s just rammed with grapefruit pith and peel and then it leaves you with a slight dryness and a hint of crystal malts. The body is velvety and full, the alcohol lurks in the background suggesting a beer that’s bigger than its 7.1 percent. This modern IPA style is so synonymous with American c-hops1 that their absence is the stand out factor in Chaos Theory. You keep expecting that big citrusy punch but it never arrives. Instead you get Nelson, Nelson and more Nelson; it’s almost as confusing to the palate as the first American IPA you tried. Take nothing away from Chaos Theory, it’s a great beer, tasty, incredibly drinkable and well crafted. I’m just not sure I like Nelson Sauvin that much. Was the original Chaos Theory single hopped? This was the first beer I had which really turned me towards hops. It was so bitter and I didn't quite understand why I loved it so much and wanted to drink buckets of it. When I had a Stone Ruination a few weeks later I suddenly realised why I loved hops. I am with you though - I'm not huge on the Nelson Sauvin hop. Done subtly it can be fantastic (Thornbridge Kipling, for example) but I find it has a habit of taking over and I think it's only good when super fresh. Mark - the original was single-hopped, it's the same beer just a new batch. Chaos Theory is my favourite Brewdog beer but my beer stocks are currently so high I really can't justify buying any at the moment. Ed: I know the feeling. I didn't buy any of the Mortlach 2008 for the same reason ... that and the postage being so much. Mark: Agree about Kipling. Another good example is Punk. When you get Punk on form there's a delicate Nelson flavour in the background, against everything else it really works well.